My family shared communion bread in my father’s hospice room before he died. We blessed it, broke it, and ate it. My mom caught a few medical professionals off guard by holding the loaf out to them when they came into the room to check Dad’s blood pressure or give him his medications. But all awkwardness aside, it was a beautiful thing to share this ritual with my dad one last time. . . . Except that Dad was past eating, even something as small and perfect as a piece of holy bread. So my mom tore off a piece for him and laid it on the pillow near his mouth. As he took his final breaths–those breaths that are ragged and uneven, those breaths that make you count the seconds between them–I imagined that small piece of Jesus’ body filtering the air. As Dad drew air into his failing body, as his lungs struggled to push air out, it flowed through the blessed and broken bread. That bread remained there when Dad died, on the pillow next to his beloved face–small and white and still. This final image of my father is a painful blessing. It comes unbidden each time I speak the words, “This is my body,” each time I offer the loaf to those who can still take and eat. For me, the phrase “communion of saints” used to conjure up vague images of sparkling lights scattered out there, somewhere–kind of like stars, but less specific, less real. Now the “communion of saints” is that hospice room. Too specific. Too real. It is the gummy bread in my mouth, the labored chewing, the effort of my tongue and throat muscles as I swallow. It is holding hands with my brother and my husband, scrunching down and twisting my head to wipe the tears on the sleeve of my sweatshirt. It is watching my mom lead this ritual as both faithful pastor and grieving wife, somehow standing strong and collapsing all at once. 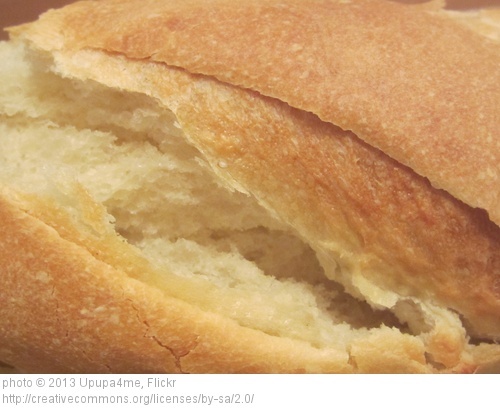 It’s a painful blessing–every time there is a loaf of communion bread, I am in the hospice room with my father again. I realize that I never saw anyone take that torn-off piece of bread away. And so it will always be there, on the pillow, next to Dad. It will always be there, holy and broken and unconsumed.